I’ve used ROHO® cushions for several years after switching from a foam cushion with a gel insert. The foam and gel cushion was causing pressure sores to form on the backs of my legs. When I consulted with a medical supply company I’d always used, they recommended that I try out a ROHO® QUADTRO SELECT. They were geniuses because as soon as I sat down on it, I could tell an immediate difference. I was sold, and from that point forward, I’ve only used ROHO® cushions. When it comes to power chairs, I had always used the same brand mainly out of vanity. I didn’t want a chair that looked like something that belonged in an old folks home. The looks didn’t do much for durability and reliability, unfortunately. The chairs rattled and squeaked constantly, and that was extremely embarrassing for me if I was trying to sneak into a meeting without disrupting the proceedings or go down a hallway at work without my jalopy alerting everyone that I was headed to the restroom. One day after having a part failure on my wheelchair while I was at work, I decided to go online and search for power wheelchair ratings to see if there was a better option for my next chair. The first thing I discovered was that the brand I had been loyal to was at the bottom of the ratings I found. Then, as I waded through the different manufacturers and models, I came across the Permobil F5 and was immediately drawn to it stylistically and also because it had very high ratings. 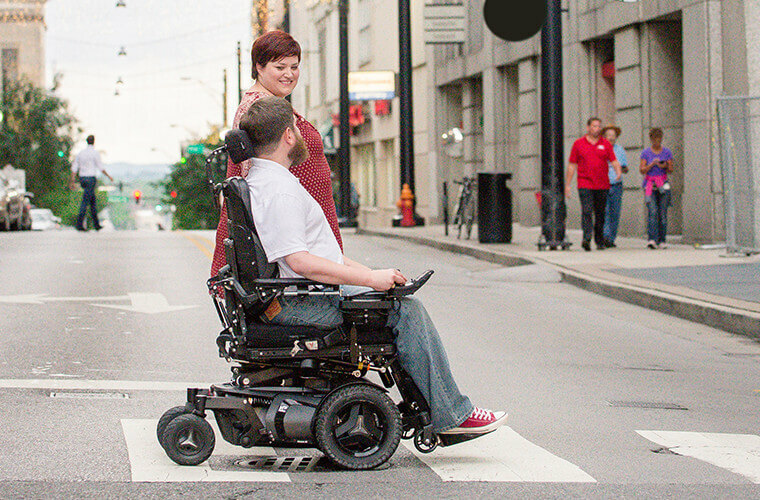 When it came time to begin the process of ordering my next chair, I selected a black Permobil F5 with the Corpus VS seating system. The first time I was able to drive it, I dinged a few door facings as I got used to the front wheel drive setup because I was used to mid-wheel drive wheelchairs. But even as I was learning to drive it, I could tell how much better it was going to be than my old wheelchairs had been. The tilt, elevate, recline, and standing functions have been a real game changer when it comes to my comfort and my ability to adapt to different surroundings as well. Even now that I have a few hundred miles on my chair, it hasn’t disappointed me in the least. I’m proud of the decision I made to go with Permobil, and I foresee my future chairs being Permobil chairs too. Permobil and ROHO have some amazing folks working for them too! !